ROAD TOWN, Tortola, VI- Minister for Education and Culture Honourable Myron V. Walwyn at the opening of the Ralph T. O’Neal Festiville in Virgin Gorda on April 4, 2015 joined the call for something significant to be named after long-time legislator Hon Ralph T. O’Neal OBE and for it to be done “fast”. However, while everyone agrees Hon O’Neal should be honoured in such a way not everyone believes it needs to be rushed. Honourable Walwyn had put forward that something more significant than the Virgin Gorda Festival must be named "and named fast" in honour of Honourable O'Neal. 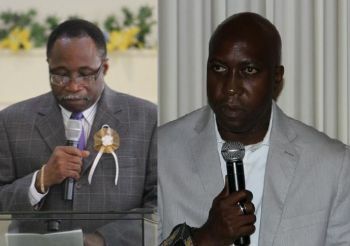 However, Virgin Islands Party (VIP) Chairman Hon Julian Fraser RA (R3) said while the VIP has been known to name things after Virgin Islanders who would have made significant contributions to the development of the territory he doesn’t see the need to be hasty in recognising Hon O’Neal in this way. Meanwhile, Senior Virgin Islands Party member Hon Andrew A. Fahie (R1) was thrilled that the Festival Committee had named the Virgin Gorda Easter Festival after Hon O’Neal and then to actually hear wonderful things about the former Premier coming out of the mouth of Hon Walwyn at the opening of the Hon Ralph T. O’Neal Festiville. Hon Walwyn’s praising of Hon O’Neal was in stark contrast to April 2011 when he had described the then Premier as “an emperor without clothes” on the elections campaign trail. “I was so pleased to hear the Minister [for] Education was able to recognise so many good things about Hon Ralph T. O’Neal and all that he has done in Virgin Gorda and the kind of leader he was. “I am always one of the advocates that he should be knighted. I am one of the advocates that something should be named after him, and it will happen but I commend him (Walwyn) for what he has done and commend Hon O’Neal for what he has done,” Hon Fahie told Virgin Islands News Online. Ralph Tilford O'Neal, OBE, born 15 December 1933 was the first person to be appointed to the newly titled office by the Governor on 22 August 2007 under the Virgin Islands Constitution adopted in 2007 after leading the Virgin Islands Party (VIP) to a landslide victory in the 2007 General Elections two days earlier. Ralph O'Neal also served a previous term as Chief Minister of the Virgin Islands (as the office was referred to under the old constitution) from 1995 (on the death of H. Lavity Stoutt). He won the next election in 1999, but then subsequently became Leader of the Opposition in the 2003 General Elections, and has held a seat in the House of Assembly, formerly the Legislative Council continuously since 1971. He has since said his time in the House of Assembly will come to a close following the upcoming general elections since he will not be seeking re-election. Hon 'Neal was educated at University of Oxford where he studied Economics. Remember quiet well 'emperor without clothes'and "empty kkerosene lamp'. With their respect now want to come with high praise. They really got 'ah we' for a set of duncie heads. Ralph deserve it. And he needs to be alive to see it happen. so why fraser have an issue with somthing being named in honor of mr oneal....ting tu talk!!!! We take too long to honor our leaders while they are alive and then when they are dead, we want to honor them. Well, the honoree doesn't know they have been honored if they are dead. I say do it while they are alive and they can feel good about it. They should name the Central Administration Building after him. WIZE UP you should be named MOOMOO UP. Name the hospital after him! Myron knows exactly what he is about. There are more Vincies living on V.G than there are indigenous V. Gs. Ralph is being used as a tool to achieve is tainted objectives. Poor Tilford is going along with his program with the hope that a monument will be built in V.G and placed in the new park. Please give the man his flowers while he alive. Education and Culture Honourable Myron V. Walwyn at the opening of the Ralph T. O’Neal Festiville in Virgin Gorda on April 4, 2015 joined the call for something significant to be named after long-time legislator Hon Ralph T. O’Neal OBE and for it to be done “fast”. WHY???? He know something the rest of us don't? Give the man what he deserves while he can enjoy it. This foolishness about naming things after dead people need to stop. Give the man his flowers while he can appreciate them. Don't do what we did to Noel on his sick bed. For heaven's sake; we have been telling him what to do for the past four years but he wouldn't listen. "go and take a much needed rest and write a book. Simple, God knows. myron and his backwards politcal games need help fast to get those red lense from his eyes, I pity him.